This book is gross. Wrestling is gross. Stephen Florida is gross. Like The Art of Fielding, Stephen Florida is the "sports novel" that is both literary and psychological. And much how popping a pimple can be deeply engrossing, this debut from Gabe Habash is unsettlingly captivating. This strange, engrossing novel is the most powerful debut I have ever encountered. Stephen's story is one of singular obsession and futility, of creating his own meaning and constructing a whole reality, a whole self around it. What follows is surreal, affecting, and entirely unique. Be forewarned-- Stephen's voice will remain in your head long after you put this book down. 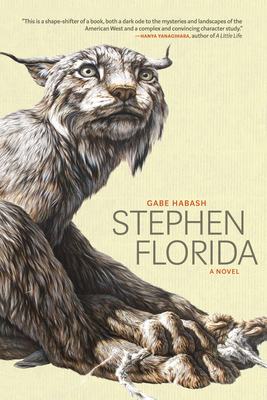 "In Stephen Florida, Gabe Habash has created a coming-of-age story with its own, often explosive, rhythm and velocity. Habash has a canny sense of how young men speak and behave, and in Stephen, he's created a singular character: funny, ambitious, affecting, but also deeply troubled, vulnerable, and compellingly strange. This is a shape-shifter of a book, both a dark ode to the mysteries and landscapes of the American West and a complex and convincing character study." Foxcatcher meets The Art of Fielding, Stephen Florida follows a college wrestler in his senior season, when every practice, every match, is a step closer to greatness and a step further from sanity. Profane, manic, and tipping into the uncanny, it's a story of loneliness, obsession, and the drive to leave a mark. Gabe Habash is the fiction reviews editor for Publishers Weekly. He holds an MFA from New York University and lives in New York. Gabe Habash: Gabe Habash is the fiction reviews editor for Publishers Weekly. He holds an MFA from New York University and lives in New York.